We invite applications for an exciting PhD studentship at the interface between ICTs and migration. This would suit someone from an interdisciplinary background with a passion for working with migrants to develop technologies that will reduce inequality. The UNESCO Chair in ICT4D at Royal Holloway, University of London is part of the UKRI GCRF South-South Migration, Inequality and Development Hub, funded by the ESRC through the UK Research and Innovation (UKRI)’s Global Challenges Research Fund (GCRF). The Hub is investigating how South-South migration – or the movement of people between less developed countries in the Global South – contributes to the delivery of the UN Sustainable Development Goals such as ending poverty and reducing inequality. The Hub is led by Heaven Crawley, Professor of International Migration at Coventry University’s Centre for Trust, Peace and Social Relations, and delivered in partnership with 20 leading universities, six international organisations, and numerous local organisations in the 12 countries in which the hub will work: Burkina Faso, Brazil, China, Côte d’Ivoire, Egypt, Ethiopia, Ghana, Haiti, Jordan, Malaysia, Nepal and South Africa. If you have a good undergraduate degree (2.1 or equivalent) and a Master’s in social science, information systems, computer science or allied disciplines with an interest, and preferably expertise, in migration and ICT4D (Information and Communication Technologies for Development) you should consider applying. The successful candidate will have skills in doing qualitative and/or quantitative research, will demonstrate an excellent level of spoken and written English, will possess good interpersonal communication skills, and should be prepared to conduct field research in one or two of the countries included in the project. More on entry requirements here: https://www.royalholloway.ac.uk/studying-here/postgraduate/management/management-phd/ Please indicate clearly on your application that you are applying for the ‘GCRF SSM Hub PhD Studentship’ and mention Dr Harindranath as potential supervisor. The 3-year PhD studentship, to begin in Sep 2019, will cover fees at the Home/EU rate of £4,195 per year and £16,553 per year for stipend. International students are welcome to apply provided they can cover the difference between the Home/EU fee and the overseas student fee. This is an excellent opportunity to work in close partnership with experienced researchers and practitioners from around the world, on a complex and challenging topic of global significance. We will conduct interviews (face-to-face or via Skype) for the studentship during May. resume or CV to show published work and any industrial experience. Shortlisted candidates will then be contacted to complete a formal application. Meanwhile, enquiries can also be submitted to Dr G. Hari Harindranath, School of Management and Tim Unwin, Department of Geography on the above , or through our contacts page. We share below in full our response to the recent call for contributions by the UN Secretary-General’s High Level Panel on Digital Cooperation. Whilst we have sought to respond to these questions in good faith, we have serious concerns about the process and its likely impact. Some of these are summarised in Section IV below. Unfortunately the consultation seems very flawed in design, and we do not believe that it will have any significant positive impact on the use of digital technologies by poor and marginalised people and communities. However, should you also hold any of the views and opinions below, do please also reflect these in your submissions to the Panel. The headings in bold (and italics) below are those provided by the Panel – our responses are listed in normal font below. a) What are the key values that individuals, organizations, and countries should support, protect, foster, or prioritize when working together to address digital issues? 1) The most important value is that of RESPONSIBILITY – at every scale from the UN, through governments and companies, down to individuals. Scientists are responsible for the technologies that they develop; countries are responsible for the regulatory environments they create; the UN is responsible for the examples of good practice and advice that agencies share with governments; companies are responsible for the harm that their technologies do. For too long, the UN focus has been on rights, but rights without responsibilities are problematic. 2) RESPECT for the OTHER. All too often, digital technologies are imposed (through marketing, sales, government action etc.) without sufficient recognition of the real needs of others. Clearly, the private sector is interested in being able to sell the same product to as many people as possible, even though this might not be in the best interests of many of those people. However, it is very important that technologies are designed with the interests of users at heart, and users have diverse interests. 3) TRANSPARENCY. This value is problematic, because it can be seen as being in conflict with privacy (below). However, transparency is crucially important in contexts such as regulatory decisions pertaining to spectrum auctions, the use made of personal data by social media corporations and others, and the monitoring of citizens by governments. 4) PRIVACY (see also Transparency above). The notion of privacy varies in meaning and understanding across the world, although a “Western” conceptualisation of the privacy of the individual has come to dominate much global discourse on this matter. Accordingly, information and data that are deemed to be “private” should not be accessible in the public domain. 5) SECURITY. When designing digital services and technologies, it is important to understand how these have the potential to impact the security of different stakeholders. Whatever approach is used, critical security questions need to be addressed at each stage of the digital design: Who or what is being secured? Who or what is doing the securing? Why is the subject being secured? Who or what is the subject being secured from? 6) THE GOLDEN RULE. In essence, this can be summarised as doing to others as you would have done to yourself; it can also be considered as doing no harm. Despite considerable discussion by philosophers about “universalism” this is probably the only universally accepted value across most of the world’s cultures and societies. It has important implications with respect to digital technologies. The behaviour of senior executives in global corporations who send their children to be educated in “digitally-free” schools, and yet make and sell technologies for use in schools would seem to run counter to this value. 7) TRUST is important at many levels when working together on digital issues. All too often digital partnerships fail because insufficient emphasis is placed on trust in their initial creation. Trust is also absolutely essential in global negotiations around such issues as Internet governance and digital security. b) What principles should guide stakeholders as they cooperate with each-other to address issues brought about by digital technology? 1) Above all else, the principle of “INCLUSION” should be at the forefront when we are “working together to address digital issues”. The needs of the poorest and most marginalised should be prioritised, especially in UN, civil society and government agendas. Digital technologies marginalise individuals and communities unless they are designed to be inclusive. Specific attention should be paid to working with people with disabilities, out of school youth, women and girls (especially in patriarchal societies), and refugees. 2) Closely allied to the value of inclusion, is the need to prioritise a REDUCTION IN INEQUALITIES rather than an increase in economic growth. For too long, the UN, governments, private sector companies and civil society have all worked in the belief that economic growth is the main way to reduce poverty. Such policies and practices have failed to recognise that in most instances economic growth fueled by digital technology has actually increased inequalities at a range of scales. This is not only morally wrong, but it has important implications for peace, prosperity and social cohesion. 3) WITH THE POOR. In the past, far too much effort has been placed on using digital technologies “for” the poor and marginalised. Technologies are designed and developed usually in the richer countries of the world, and then promoted as being useful in the reduction of poverty. This approach is fundamentally flawed. Instead digital technologies should be designed WITH the poor. Indeed, the poorest and most marginalised should be at the heart of determining the needs that these technologies should serve, the sorts of technologies that are developed, and how they are used. 4) DRAWING ON EXPERIENCE. Far too many uses of technology in development practice reinvent the wheel. Insufficient attention and understanding is placed on understanding the successes and failures of the past; this is costly and all too often replicates failure. 6) MITIGATING HARM. Much global attention, especially by UN agencies, not least through the WSIS process, is focused on showing how ICTs can be used positively to deliver the SDGs. However, this is only part of the story. ICTs can equally be used to do harm. Therefore, all initiatives using digital technologies for “development” should pay as much attention to mitigating harm as they do to doing good. 7) LANGUAGE matters. The words we use not only reveal the way we think, but they can also shape the thinking of others. They therefore need to be used carefully. Much focus in the tech sector is on connecting the “next” billion; but this will only increase inequality because the poorest and most marginalised will be left behind. However, we should not aim to connect the “bottom” billion because this is pejorative; instead we should call them the “first” billion because they are most important. Hence our focus should always be on the “first billion” when we think about and deliver initiatives designed to support the poorest and most marginalised. 8) A shift from the INDIVIDUAL TO COMMUNAL interests. For too long, the emphasis of tech companies, governments and indeed the UN (as in INDIVIDUAL human rights) has been on the individual. However, there are strong arguments that shifting the emphasis to communal interests would create a fairer and more equal society. The working out of this principle can be seen in the tensions, for example, between the USA (more individualistic) and the EU (more communal) in negotiations relating to digital technologies. 9) Widespread and informed PUBLIC ENGAGEMENT about the kind of digital future that our societies want. This is particularly important with respect to debates over AI and cyborgs. Some fear that it is already too late to prevent “pure” human beings from becoming extinct as they are replaced by machine-humans or human-machines; others argue that this does not matter, and that humans have always used machines for their own advantage. 10) DESIGN AT SCALE. The model of private sector companies and civil society organisations funding and delivering small pilot scale projects in the expectation that they can then be rolled out globally is fundamentally flawed. All too often, those promoting these pilots bemoan that governments will not fund them to go to scale and be sustainable. The fundamental problem here is that most were never in the first place designed at scale, and it is therefore scarcely surprising that no-one can find the necessary budgets for them to be rolled out more widely. 11) FOCUS ON WHAT WORKS WELL and not just on innovation. Innovation is important, but most innovations fail. It is therefore at least as important for donors and governments to fund what is known to work quite well, and then make it even better and more widespread, rather than focusing only on innovations (many of which will fail, and thus reflect a waste of money). c) How can these values and principles be better embedded into existing private and/or public activities in the digital space? There is a huge literature on this. Section 5 below highlights some of the more valuable work that the panel should read. If there is only one book you have time for, you should read Tim Unwin’s (2017) Reclaiming Information and Communication Technologies for development (OUP). 1) The role of PRIVATE sector companies. The private sector cannot be expected to deliver on the needs of those who cannot pay for its goods and services. The role of companies is to make profits for their owners and shareholders. Many governments and UN agencies see companies primarily as sources of additional revenue, often through their Corporate and Social Responsibility (CSR) budgets. However, more often than not, the real benefits of involving private sector companies in technology for development initiatives are in their ability to deliver on the ground, their focus on ensuring ‘profit’, and thus on ensuring sustainability. 2) The role of the PUBLIC SECTOR. The public sector (governments) is theoretically the only sector (of the three: public, private and civil society) that should have the interests of all of their citizens at heart. Hence, they must play a crucial role in serving the interests of their most marginalised citizens. A real challenge here is that many of those in governments are seen as being self-serving, and in such circumstances citizens often say that they trust companies more than they do their governments. Given the absolutely crucial role of governments, much more needs to be done to help train politicians and civil society (and indeed UN agencies) about digital technologies, so that they can take wise decisions in the interests of all. 4) OPEN and PROPRIETARY solutions and INTELLECTUAL PROPERTY RIGHTS (IPR). The balance between open and proprietary solutions is complex and varies in different contexts. There are strong arguments that anything that is funded by governments should be open and accessible to all. However, IPR can act as an incentive for people to create new solutions from which then can benefit. This can in turn motivate them to gain digital literacy and information security skills that they need to be self sufficient. For the sake of collaboration and development, it may also be useful to make more intellectual property available for free to them, and at the same time not take and register their cultural symbols, traditions, designs, unique products and services to patent and copyright them in some developed country system. 5) A focus on the POOREST AND MOST MARGINALISED. Above all, if we wish to use digital technologies for all, we must always ensure that they are designed in a way that is inclusive and does not further marginalise the most marginalised. The evidence of the past, however, suggests that this is unlikely to happen. It is the rich and powerful who have always used technologies primarily to serve their interests and remain in power. a) How do the stakeholders you are familiar with address their social, economic, and legal issues related to digital technologies? How effective or successful are these mechanisms for digital cooperation? What are their gaps, weaknesses, or constraints? How can these be addressed? This question is ridiculously broad, and relates closely to other questions, so there is a danger of simply repeating what we have already stated. 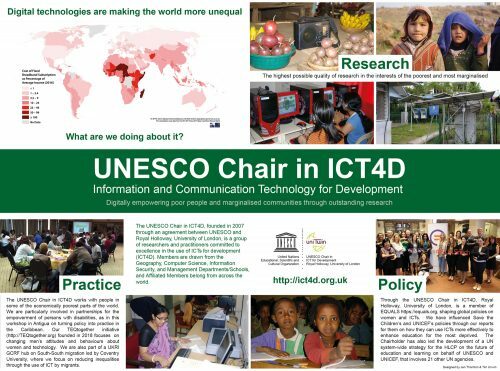 Members of the UNESCO Chair in ICT4D work with governments, the private sector, civil society and academia, and some of us have >40 years of experience in using digital technologies in these sectors However, in brief, we would make the following observations on mechanisms for digital co-operation. To stimulate co-operation, it is important to ask critical questions about what benefits digital service and technology provide people with (see literature in V below), and it is also essential to understand the many barriers (access, skills, knowledge, affordability, relevance) to accessing those benefits and how different barriers shape access for different communities. focus on economic growth rather than reducing inequalities. It should be emphasised that a lack of funding is NOT usually a barrier or constraint. A good well-designed and appropriate initiative can always find ways of being funded. Indeed, it is not usually the funding, but rather the will of those involved actually to deliver, that is the biggest problem! focusing more on the impact that digital technologies have on inequality than on economic growth. b) Who are the forgotten stakeholders in these mechanisms? How can we strengthen the voices of women, the youth, small enterprises, small island states and others who are often missing? 2) How to STRENGTHEN THE VOICES. This is indeed a really important but difficult question. The usual arguments are that: democratic processes can involve them; the Internet Governance Forum (IGF) is a mechanism through which their voices are expressed; social media platforms can be used; and we should draw on the experience of those who have deep working knowledge of their needs and wishes, such as civil society organisations. But none of these have really yet worked effectively (see Unwin, 2017 – in Section V – for a discussion of these issues of voice, and further references cited therein). There is also no one-size-fits all solution. on youth – again there are real problems in identifying “representative youth”. All too often youth representatives replicate existing power structures in the countries from which they come. Furthermore, they are often also often treated very patronisingly – their voices should not only be listened to, but also really acted upon. We also need more interaction between the elderly and the young. Reverse/360 degree mentoring can be valuable in this context. c) What new or innovative mechanisms might be devised for multi-stakeholder cooperation in the digital space? Why always look for the new, when the old could work if better delivered? There is a huge literature on technology partnerships and cooperation, but few people take the time to read it. The lessons are very well known. The trouble is that many people actually want to reinvent the wheel, often because they want to claim something for themselves as being new, but also often because they think they do not have time to learn how to deliver what they want. There is also a problem with terminology. Most people now use the term “multi-stakeholder”, when what they actually mean is “multi-sector”. Multi-stakholder only means having many stakeholders, which could all be from, for example, the private sector! In general usage, though, the term is usually now used to organisations, cooperation or processes that involve the private sector, the public sector and civil society – and so in such instances should properly be called “multi-sector”. As noted above, language is very important. “Success is increased when detailed attention is paid to the local context and the involvement of the local community in partnership implementation. It is important for such partnerships to have clear and agreed intended development outcomes, even where constituent partners may themselves have different reasons for being involved in the partnership. A supportive wider ICT environment needs to be in place, both in terms of policy and infrastructure, if such partnerships are to flourish and deliver effective development outcomes”. A political and infrastructural environment that is conducive to the implementation of partnerships and cooperation. Without this, there is little point in starting. Engagement of all relevant stakeholders as early as possible in the initiative. The involvement of a high level champion, as well as leaders of all of the entities involved. The identification of clear and mutually agreed objectives for the partnership or cooperation at the very start. Consistent monitoring and evaluation of the partnership or cooperative process and its intended outcomes. Again, this must be done from the beginning by ensuring a baseline study exists to enable impact and outcomes to be measured effectively. A clear and realistic resourcing framework, whereby each partner is explicit about the resources that they are willing to make available to the partnership or cooperation, as well as their expectations of the benefits of being involved in the partnership. Mechanisms must also exist for the inclusion of additional partners at stages during the process where new needs are identified. An ethical framework that emphasises a focus on transparency, and helps build trust within the partnership or cooperation. A management office and/or partnership broker to ensure the day-to-day and effective management and delivery of the partnership or cooperation. This is not new, but is rarely undertaken in practice. Perhaps it would be new to change our approaches away from the “fetishisation” of innovation and focus instead on what we know works. building the capacity of individuals, institutions and governments for the digital transformation. a) What are the challenges faced by stakeholders (e.g. individuals, Governments, the private sector, civil society, international organizations, the technical and academic communities) in these areas? Again there is a wealth of good research and practice in these areas. The panel would be advised to read some of this literature. The values and principles noted above in our responses to Section 1 are also highly pertinent here. b) What are successful examples of cooperation among stakeholders in these areas? Where is further cooperation needed? There are remarkably few really good examples of successful cooperation and partnership in the interests of the poorest and most marginalised. Much depends on how success is defined. Some famous initiatives (such as the NePAD e-Schools Project in Africa a decade ago) have often been described as successes (from the perspective of individual stakeholders), when they were actually complete failures with respect to enhancing education of children systemically across Africa. It is interesting that the question posed here is “Where is further cooperation needed?”. If existing cooperation is poor, then it is clear that we should not have further such cooperation, but instead need to change the nature of such cooperation, as suggested in IIIa above. c) What form might cooperation among stakeholders in these areas take? What values and principles should underpin it? This question has largely been answered by responses to Section I on values and principles. There are very many guides to good cooperation and partnership that the Panel should read if they are not already aware of their content. The references included in the material cited in Section V will provide plenty of food for thought. In addition, though, it should be emphasised that we have specifically outlined above some of these points in relation to digital security and trust. Another aspect to consider is the starting point for the design of digital technology and services. Some principles for engendering trust in digital design are again outlined in the references in Section V under “Security”. IV. Do you have any other ideas you would like to share with the Panel? Unfortunately the questions in this consultation are somewhat broad and repetitive. Most have already been answered in the very extensive literature that exists, some of which we list below in Section V. We wonder how much time panel members actually have to read some of the most important texts on the subject? The answers to most of the questions herein are well-known; the challenge is to act upon this knowledge. It is a challenge of “will”. We also noted above our concerns about the role of the High-Level Panel on Digital Co-operation, and remain unconvinced that it is the appropriate vehicle through which real change can be delivered. There are already UN bodies and structures that could readily have fulfilled this role. Why was there the need to create yet another high-level body? The structure of the Panel is also problematic if it intends to understand and deliver on the key issues noted above. Whilst efforts have clearly been made to get reasonable gender and regional balances, the panel is heavily made up of elite people, and has a strong private sector emphasis. Few members are from very poor or marginalised backgrounds, and although many might claim to know about poverty and marginalisation, few have really experienced it. Moreover, the poor design of this “consultation/survey” generates concern whether the analysis will make a significant difference to global policy or practice. We have nevertheless responded in good faith, and hope that our concerns over the likely impact are misplaced. V. Please provide your numbered references or links to additional reports/documents here. Geldof, M., Grimshaw, D., Kleine, D. and Unwin, T. 2011. What are the key lessons of ICT4D partnerships for poverty reduction? London: Department for International Development. Unwin, T. (2015) MultiStakeholder Partnerships in Information and Communication for Development Interventions, in International Encyclopedia of Digital Communication and Society, Chichester: Wiley, 634-44. A group of leading international migration experts – including from the UNESCO Chair in ICT4D at Royal Holloway, University of London – has won £20 m backing from the UK Research and Innovation (UKRI) Global Challenges Research Fund (GCRF) to explore how South-South migration is affecting inequality and development in less developed regions. The South-South Migration, Inequality and Development Hub won funding for the five-year project under the UK Research and Innovation (UKRI)’s Global Challenges Research Fund (GCRF) call to establish interdisciplinary research Hubs addressing complex global challenges. The recipients of the awards were announced on 10th December 2018, and made public on 22nd January 2019. Dr G. Hari Harindranath (School of Management, and member of the UNESCO Chair in ICT4D) and Professor Tim Unwin (Department of Geography and Chairholder of the UNESCO Chair in ICT4D) from Royal Holloway are among the experts who, as part of the Hub, have been awarded £688,000 to investigate how South-South migration – or the movement of people between less developed countries in the Global South (for example between African countries) – contributes to the delivery of the UN Sustainable Development Goals such as ending poverty and reducing inequality. They will work alongside academics, artists, community leaders, international organisations and policymakers from 12 countries across South America, the Caribbean, Africa, Asia and the Middle East better to understand international migration patterns and consequences, and to support and influence global migration policy development. South-South migration is estimated to account for nearly half of all international migration (up to 70% in some places), but its potential benefits have been undermined by limited and unequal access to rights and the economic and social opportunities that migration can bring. Using a wide range of research methods and creative approaches, the Hub will map, record and draw attention to the experiences of those who move, generating a better understanding of – and encouraging a greater range of policy responses to address – the challenges associated with international migration. It is hoped that the work will re-balance academic and political debates, currently driven largely by the perspectives and priorities of countries in the Global North. Numerous local organisations in the 12 countries in which the hub will work: Burkina Faso, Brazil, China, Côte d’Ivoire, Egypt, Ethiopia, Ghana, Haiti, Jordan, Malaysia, Nepal and South Africa. Dr Harindranath and Professor Unwin’s work package on ‘Leveraging ICTs to address inequality’ focuses on understanding the extent and ways through which the application of ICTs has alleviated or exacerbated existing inequalities in the context of South-South migration, as well as successes and challenges facing the use of ICT for migrant-related development outcomes. It also considers how the potential benefits of ICT can be leveraged to ensure that the developmental benefits of migration are harnessed and increased, particularly through reducing inequalities in ICT access and use.